In the full game, each player receives seven occupation and seven minor improvement cards. These cards are unique to each player and can form the basis of a game-winning long term strategy if used right. The only Major Improvement I decided to put on this list, the Fireplace is an improvement available to up to two different players within the game. For two (or three) Clay it is a very versatile object that can convert livestock, Grain and Vegetable to food tokens on at least a 2:1 ratio. 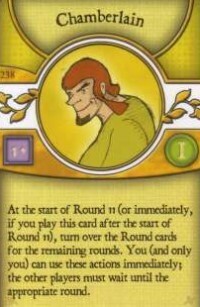 During round one, there is the possibility of the Sheep action card turning up early in Round one or two. This can often mean Sheep building up over a number of turns untouched as players pick up other resources in order to eventually take them. In terms of raw resources needed, two Clay is often easier to find than 4 or 6 Wood for a pasture. 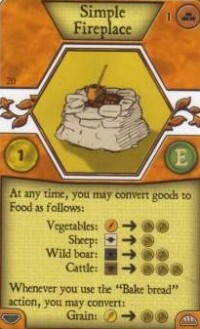 If you are the first to build a Fireplace and no-one else has built fences, the Sheep action card can act as an exclusive supply of food. Of course, as soon as someone builds (or is in a position to build) the other fireplace or fences, you should then take them using your next available person. In later rounds, the Fireplace can often make the Wild Boar and Cattle action spaces a potentially better food source than Travelling Players/Day Laborer/Fishing. It also ensures that you are never in a position to breed more animals than you have space on your farm (since you can eat a non-parent animal to make way for the newborn). Whilst it is perfectly viable to win without a Fireplace (or Cooking Hearth), taking the opportunity to build one early in the game can give you a lot of flexibility. 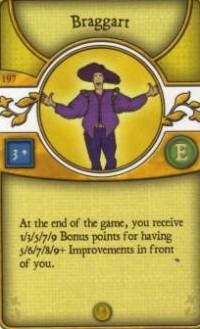 The Braggart is an occupation that can net you up to nine bonus victory points at the end of the game. The potential of the Braggart occupation is directly related to the quality of your seven minor improvements you receive at the start of the game. Whilst you can play the Braggart casually (that is, just build the Improvements as you need them for your farm), to get the full nine points, you need nine improvements from a mixture of both the Major and Minor variety and consider a dedicated strategy. For this strategy, you need as many of your minor improvements should be as cheap as possible in terms of building resources (i.e. Wood, Clay, Reed and Stone), with the ones requiring only occupations being among the best. Improvements that require you to pass the card to your neighbor afterwards do not count towards the Braggart. Generally speaking, because you need lots of building resources to pay for your improvements, the quality of your farm will not be so high as your actions will be concentrating on the resources spaces rather than taking animals, Grain or plowing fields. Picking up the Pottery or Workshop (or both) should be an early priority since they help feed your family as well as help towards the Braggart. 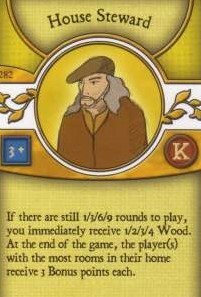 Playing a game with the Braggart in mind definitely makes for a different experience than your usual Agricola approach. If you play a variant where you have a degree of choice about your cards (e.g. drafting) then the playability of Braggart goes up considerably. 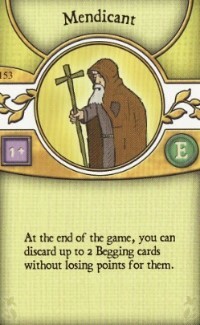 The Mendicant is one of only two cards that allow you to give back begging cards you have accumulated during the game (the other being the Minor Improvement "Holiday Gift" from the Gamers Expansion Deck). As a result, this gives you a unique opportunity to make much better use of your people during key moments of the game. You want to pay one Food to play an occupation this round, leaving you a food short for the harvest. You have 4 Food, but you also want to play an occupation (that costs one food) next round. So you pay three Food and take a begging card, which allows you to do so. You have 3 Food, one Grain. 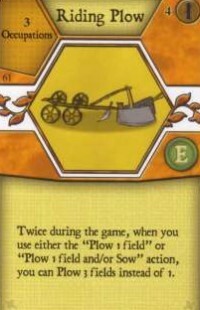 For your last action, you plow a field. 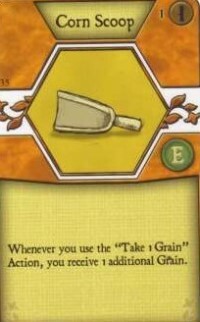 Rather than eat the Grain during the harvest, you take a begging card so you can sow your Grain next round instead. What all these examples have in common is that they all save you having to use more actions to achieve the same goal then if you were required completely feed your family. Therefore rather than just take 2 begging cards during the first harvest, save them for when opportunities like those above arises. Occupations that allow you to grow your family without using the action space are very powerful indeed. With different players racing for the Family Growth action space from turn five onwards it can be tricky to manipulate other than just by going first in the next round. Once you have paid this cost and taken into account the extra food needed during the next harvest phase, finding all this food might be a bit more difficult. However, the payoff is usually worth it once the new family member starts taking their actions, so it is definitely worth trying to prioritize these occupations if you can. The taster and chamberlain, whilst different in functionality, have one thing in common: giving you access to action spaces you wouldn't otherwise be entitled to. The taster allows you to jump ahead of the Start Player by paying him a food: Compared to the value of the action space you may have just stolen from another player (e.g. Family Growth, Plow and/or Sow or a heavily accumulated resource space), the price of one food is relatively minor. With Chamberlain, having uncontested access to Family Growth and Plow/Sow for a short time is simply amazing. 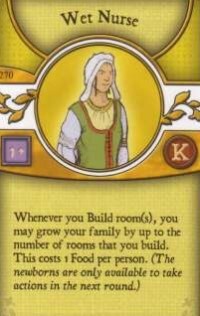 In a four player game, an opponent builds a wooden room in round six and Family Growth will show up for the first time in round seven. Since no other player can use the build room action this turn, he feels confident that no one can beat him to the Family Growth space next round. You take Start Player and build "Wooden Hut Extension": suddenly, you have just jump in front of him and upset what seemed to have been an infallible plan. In the four and five player game, a single stone is generally not too hard to come by. 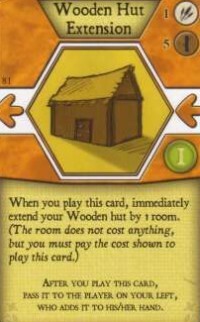 or accumulate enough wood and reed to build two or three wooden rooms at once and get to a large family as soon as possible (assuming you can feed them of course). 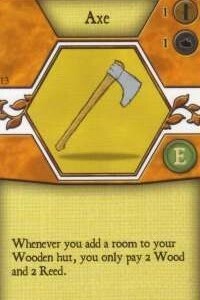 For a relatively cheap improvement, the Axe is a powerful card. Like the Axe, it has a cheap cost but a big effect. Being able to take two Grain instead of one makes the Sowing/Baking aspect of the game a lot easier. More often than not, you want to maximize going to the Sow/Bake Bread action space by having enough Grain to do both (since it advances your farm and feeds your family at the same time), but often you may find yourself only doing one or the other. Visiting the Grain space less frequently frees up actions to improve other aspects of your farm. All these cards offer victory points to one or more players who fulfills the condition on the card. Letting your opponents know about these victory conditions early is incentivized by providing you with an amount of Wood depending on when you play it. Play it early and you get four wood and lets your opponent know about this opportunity early as well. The 3 Wood space (or 4 wood space in 5 Players) is often just as good a choice. Playing them as an early occupation increases the food cost of future occupations (as usual in the game). If you don't achieve the conditions, but an opponent does, then those three victory points might end up being crucial. They usually require played occupations and Wood (usually between one and three) .All of them can be used on the Plow Field Action space. Some, but not all of them can also be used on the Plow/Sow Action space. They allow you to plow either one or two additional fields when you use the action space. You can use the ability either once or several times during the game .Some plows also other players to do the same ability by paying you food. Additional fields from plowing are good: They help fill up your farmyard faster and allow you to sow more grain and vegetable. Cheap Plows are better at getting more Grain and vegetable planted faster whilst the expensive ones are used primarily to fill up farmyard spaces (since the conditions are quite invested early in the game).